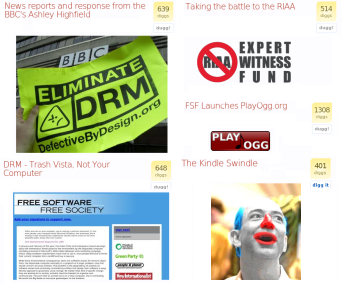 It's wonderful to see a campaigning group based on fighting DRM. Defective by Design has pulled off a number of audacious and clever actions that have raised public awareness of DRM. The fight starts here. Join Cory Doctorow as an FSF member in the Fight Against DRM! There is no other organization working as hard in the fight against DRM as the Free Software Foundation's (FSF) DefectiveByDesign campaign, but we need to be working harder to curb the threats we face. Music, video, and ebooks are all being locked up in DRM. Your monetary contributions go a long way toward making more of the big public splashes we've made, and keeping the pressure on behind the scenes. While Big Media pumps millions into their campaigns, DBD is fighting them through our grassroots coalition-building effort. We would like to attack issues immediately, create more demonstrations, and have more regular actions, but to do that we need your support. The latest sales pitch by companies like Wal-Mart and Amazon.com to sell their music is to advertise it as DRM-free. When major vendors are taking our side and using "DRM-Free" as a sales pitch, you know that the message is being understood by consumers and that our campaign and your support is seeing success. Help us eliminate DRM on all music!. Thanks to the efforts of DBD and the DRM Elimination Crew Members, Amazon.com has over 1,500 products tagged with defectivebydesign. Amazon.com is attracting buyers by advertising their music as DRM-free. However, they are two faced when it comes to ebooks. Their latest swindle is encouraging people to buy the Amazon Kindle, and to purchase the proprietary Kindle-only, DRM-infected ebooks. We must continue to educate consumers about DRM on ebooks and stand up to Amazon—not just for our freedom today, but to protect the Future of Reading for generations to come. DRM on ebooks locks the books to a device and into a secret proprietary format that is illegal to circumvent. We can't lock our books into a format, vendor, and device. Help us eliminate DRM on ebooks! Our protest against the BBC in October has lit a fire under the BBC Trust's director of future media and technology, Ashley Highfield. Our protest and ongoing bombardment has forced him to respond publicly dozens of times, and the pressure is getting to him. He is sick of our complaints, and his latest defense is to pretend he agrees with us, stating that BBC needs to "move beyond DRM in the long run." This save-it-for-another-day attitude is just a cop-out, and any talk about the elusive "open DRM system," is just a red herring to divert the conversation and appease the crowds. We must keep the pressure on the BBC! Help us Remove DRM from Video! Make a directed donation for a specific fund, such as the RIAA expert witness fund or the End Software Patents campaign. Thank you for all you have done to to make Defective by Design a success! But, the fight isn't over until DRM is eliminated!